Observation - Carrion Crow - UK and Ireland. 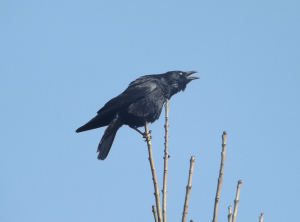 Description: This crow caught the eye, because it was perched on what seemed an impossibly thin twig at the top of a tree in the grounds of Llanelli WWT. The first picture shows it protesting at the nearby passage of another crow. This crow caught the eye, because it was perched on what seemed an impossibly thin "twig" at the top of a tree in the grounds of Llanelli WWT. The first picture shows it "protesting" at the nearby passage of another crow.